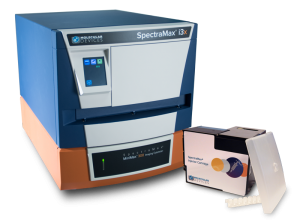 The SpectraMax i3x Multi-Mode microplatereader measures spectral-based Absorbance, Fluorescence, and Luminescence with the added functionality of modular upgrades for Western Blot, Imaging and Fast Kinetics with Injectors. The SpectraMax i3x reader allows one to unravel the mysteries of science by exploring cellular pathways and protein activation and expression in one system. 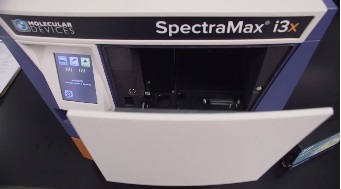 The SpectraMax i3x provides full flexibility to add novel detection capabilities based on changing needs. The SmartInjectTM Technology allows expansion of capabilities to include flash based applications, including dual luciferase and ATP assays. Engineered for high performance, the auto dual injector cartridge ensures complete reagent mixing and allows for rapid signal development besides including fail safe features including bubble detection and overflow protection to save precious reagents and maximize performance. User-exchangeable detection modules expand detection capabilities to include Time-Resolved Fluorescence, HTRF, Fast Kinetics with Injectors, cell cycle analysis, epigenetics, fluorescent protein expression, FRET, genotyping, GPCRs, GTP binding, membrane potential assays, reporter assays, Time-Resolved Fluorescence (TRF), Immunoassays, Nuclear receptor , nucleic acid and protein quantitation , Flash based applications such as dual luciferase and ATP assays and Western Blot detection. The ScanLater Western Blot Detection Cartridge is a user-installable option for the SpectraMax i3x and simplifies the traditional western blot protocol by employing a europium-labelled secondary antibody which is then read by Time-Resolved Fluorescence(TRF). The assay demonstrates sensitivity in the high femtogram, comparable to traditional chemiluminescence western blot methods. The SpectraMaxMiniMax 300 Imaging Cytometer option, which is field-upgradeable, provides cellular analysis capability without the need to invest in complex imaging systems. This option helps in obtaining cell-based data in addition to well-based intensity readings, eliminate cell staining for cell counting andconfluency with StainFree Technology, perform multi-parametric assays and get rich, cell-by-cell statistics and easily measure low cell concentration samples. The SoftMax® Pro Software features over 140 ready-to-run protocols for our microplate systems, 21 different curve fit options, analysis algorithms, third-party data import options and is the most versatile Package available for multi-mode microplate data.